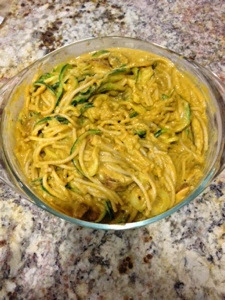 I am obsessed with our spiralizer. 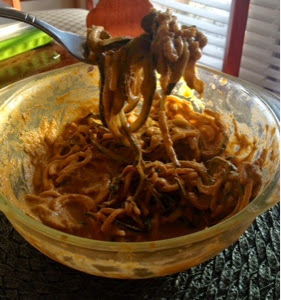 So the other day when I was craving pasta (I didn't want to go full-on carb with all brown rice pasta), I used the spiralizer to make zucchini noodles. 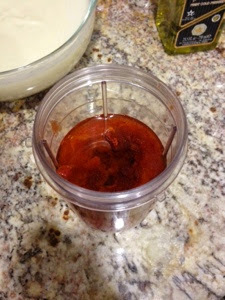 I also made a variation of a tomato sauce (I have never made the same one twice). For the pasta: cook brown rice pasta according to package (I add garlic powder and cayenne pepper to the water). lightly steam zucchini spirals (only for a minute, optional). Also, the brown rice pasta is optional. You could just use zucchini and make a raw pasta. 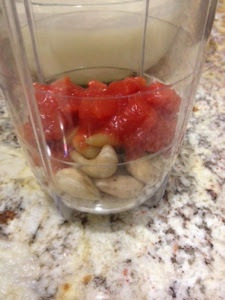 Sauce: blend all ingredients together until it has reached the desired texture.